Did you know you can even hide specific applications from showing up in Unity's Dash search on Ubuntu? Well, if your answer is no, and you're interested in knowing how you can do this, you'll be glad to know we'll quickly discuss a solution here. Please note that all commands and instructions mentioned here have been tested on Ubuntu 16.04LTS. Suppose you want to hide the Vim icon, which currently shows up when you search for the editor in Dash. So for this, first search for the corresponding .desktop file (vim.desktop in my case) in /usr/share/applications directory. And then copy it to the ~/.local/share/applications directory. Now open the copied file in an editor (say gedit) and add the following line before the line 'Actions'= (if it exists), but below the first line. That's it. Save the file, then log out, and log in again. 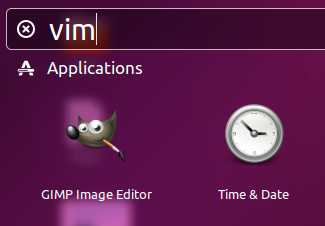 Now when you'll search for Vim in Dash, the application's icon will not show up. To make the application re-appear in Dash search, remove the local copy you made in the beginning.